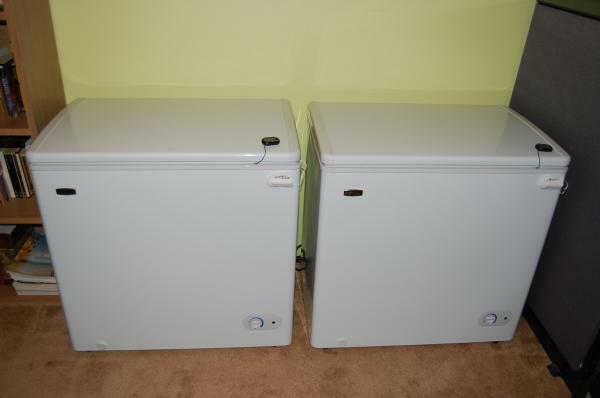 In March of 2008, I retired my 10 year old 22 ft^3 chest freezer and replaced it with these two new smaller 5.5 ft^3t chest freezers. The only place I can easily fit a large freezer is in our garage which is outside the building envelope (ie it’s unheated and uninsulated). The smaller freezers, however can easily be maneuvered into the house. We heat our home with electric space heaters (see Convert from Gas to Electric Space Heating to learn why). Our heating season is about 6 months of the year. Freezers, like all electrical appliances, produce heat. It takes the same amount of electricity to produce a given amount of heat whether that heat is generated by an electric space heater, or a freezer, or any other electrical appliance.Â Therefore, moving the freezers inside effectively reduces the operating cost to zero for 6 months of the year when the heat produced by the freezers offsets the heat produced by our space heaters. If I had purchased a single larger freezer, I would have had to keep it in the unheated garage and pay for its operation a full 12 months of the year. The amount of freezer space we need varies throughout the year. During the summer months, one 5.5 ft^3 freezer is plenty. We need the extra 5.5 ft^3 just before winter when we preserve various foods we’ve harvested or purchased. With two freezers, we can simply unplug one during the summer months. The cost of operating the two freezers during the 6 month heating season is zero for reasons described above, and during the other six months, only one of the freezers needs to be operated. Thus the annual operating cost of the two small freezers is only around 25% of a larger freezer of equivalent total volume. It is much easier to clean out or defrost freezers when you have two of them. In the summer when one freezer is empty, contents can be transferred from one to the other making it easy to clean and/or defrost the freezers. It is also much easier to move a small freezer to clean around it. If either freezer should fail in the summer, we can move the contents into the other. If either freezer should fail in the winter when both freezers are operating, we can move the most important contents into the working freezer. Using a kill-a-watt meter, I measured the performance of the old and new freezers. I also estimated the performance of the 10 ft^3 freezer I was also considering. It can be seen that by year 7, the 5.5 ft^3 option has a lower cumulative cost than the 10 ft^3 option. By year 9 both the 10 ft^3 and 5.5 ft^3 options have a lower cumulative cost than the 22 ft^3 option. In other words both the 10 ft^3 or 5.5 ft^3 options pay back in about 9 years. However, after that the 5.5 ft^3 option pays back more. All electrical appliances produce heat. If you are heating your home with electricity, it doesn’t matter whether the heat is generated by an electric space heater, or a freezer, or a computer, or any other electrical appliance. You will consume the same amount of electricity to produce the same amount of heat. So if you’re going to use the electricity for heating anyway, you might as well do something more useful with it first. Operating a deep freeze is just one possibility. You might also consider growing some of your own food indoors using grow lamps, or doing more cooking and baking in the winter months. Adding more insulation to the walls of a deep freeze isn’t as easy as it sounds since the refrigeration coils are embedded inside the walls. Adding insulation in the wrong place will reduce efficiency rather than improve it. I considered adding insulation to the lids and UNDER the freezers but frankly the $5.30 per year it currently costs in energy to operate the freezers doesn’t make them a high priority for further energy reduction strategies. I like the concept… We put an analog switch on our fridge on an unheated mudroom and it didn’t use any electricity for most of the winter. It meant our food wouldn’t go bad due to a power outage. On the other hand, it was more like walking into the fridge every time we needed something. We even just kept food on top of the fridge rather than bothering to open the door since the inside and outside were the same temp for months. Fridges/freezers do not create heat (besides the heat generated by the compressor running). They simply ‘pump’ it around. Simply said, you are not cutting the cost to 0 in the winter because you are simply using energy to move heat that escaped into the box that you want to be cold. An ideal phase-change freezer does not produce any heat, it simply moves it and that still takes energy. I think that your argument for having ’em inside still holds some water**–just not as much as you wish. The heat generated by the compressor running is exactly what I’m talking about. Any electrical energy you put into any appliance (for example to run the compressor of a freezer) is released into the home in the form of heat (assuming no net energy storage as in the case of charging a battery). The law of conservation of energy requires it. So from the perspective of the rest of the house, a freezer is just a big electric heater. If you put 30W of electricity in, on average you get 30W of heat out. If you are heating your home with electricity anyway, it makes no difference to your cost whether you do it with an electric heater, or a freezer, or a computer, or a stereo, or a light bulb or any other electrical appliance, or any combination of them. They all produce heat exactly equal to the electrical power they “consume” (energy cannot really be consumed… only changed from one form to another). So whatever you can do with the electricity first (like running a freezer) is just a happy byproduct and has a net cost of $0 in terms of electrical consumption. To state it yet another way… You might think you are paying for electricity to run your fridge, computer, stereo, tv, light, etc, but in the winter, you’re really only paying for electricity to heat your home. Attempting to reduce your electrical consumption by turning off any of these appliances is pointless. It will simply result in a corresponding increase in electrical consumption by your heaters in order to maintain the temperature at your thermostat setting. This is a bit of a simplification, ignoring the fact that location within the home does have some effect. There’s little value in heating unoccupied rooms. I realize this is a little late, but I figured I’d hop in anyway. 3. If the heat output of the freezer is equivalent to the electric input, then your freezer will run forever! Yay! Not really. Apply that to an electric motor in a car, and you’ll get a perpetual motion machine. You’re right that a lot of devices put out a lot of heat as waste, but if electricity is the only energy going in, and heat is the only energy going out, then the device is doing nothing but generating heat. Outputting light (monitors), doing math (computer chips), spinning a motor (blender)…that all takes energy too. The heat output of a device = electrical energy going in minus the amount of energy used to perform other tasks. I hate to harp on the issue and perpetuate a “You’re wrong”… “No. You’re wrong.” argument… but… well… you’re wrong. In your thought experiment, the reason you can’t turn a freezer into a perpetual motion machine isn’t because the motor and compressor consume energy. It’s because a 100% efficient thermogenerator isn’t possible. If it were possible, and if you could capture all the heat released from the freezer and convert it back into electricity, you COULD quite literally run the freezer forever off it’s own heat. Energy cannot be created or destroyed. It can only be converted from one form to another. I think we agree on that at least. So… here’s another thought experiment… If you run an electric motor you are converting electrical energy into kinetic energy. When you turn the electricity off, the motor will slow to a stop. When stopped, there is clearly no more kinetic energy. The slowing of the motor indicates the conversion of kinetic energy into another form of energy. So… to what form has the energy finally been converted? Answer: heat. Likewise all the electrical energy you put into a freezer is eventually released as heat. Yes, it first gets converted to kinetic energy in the motor and compressor, but the kinetic energy is eventually converted to heat. The law of conservation of energy requires it. If electricity is the only energy going into the system, and heat is the only energy coming out (and no energy is being stored inside), then the heat energy coming out must equal the electrical energy going in. From the perspective of the outside, the device IS doing nothing but generating heat. The fact that other tasks are performed inside the system is irrelevant. Yes, they all take energy in the form of electricity, and give it back in the form of heat energy exactly equal to the electrical energy “consumed”. A formal education in physics (math minor), albeit 20 years ago, has really helped me in these ‘energy matters’. Unfortuneately, I very often find myself alone in a crowded room regarding such debates. You seem a pretty intelligent room. So. Practically speaking, you are, in fact, correct, I believe, that virtually all energy ‘consumed’ in a home for various tasks winds up as heat. Most produce alot of heat directly, i.e. they are ‘inefficient’. Motors, televisions, computers,… these things all get hot… at least mine do. Consider even that the steam turbine to generate such electricity is, at best, 49% efficient, in the most elaborate multi-stage turbine set-up. What happens to the other 51%? Why heat, of course. Unused heat. Unless, as you have very rightly pointed out, you’re using such steam turbines in the building you’re living in… in Antarctica. Then, the ‘unused’ heat is really used after all. But, as I don’t often get to exercise academic muscle very often, consider this: the conversion of kinetic energy to potential energy, from a thermodynamic point-of-view. If you use a motor in a room to lift a heavy object up to a high shelf, you will generate heat from the motor, along with the kinetic energy. But then, after the lift, you turn the motor off. Where has the energy gone? Why it’s stored as potential energy in the heavy object at height. The next day, drop the object to the floor, and the potential energy is released. Of course, ultimately dissipating to heat as the object rests on the floor. So there’s the heat again, but it’s been displaced by a day. This is fairly facitious, of course. You couldn’t heat your house in the winter by dropping weights from the ceiling that you lifted there in the fall. At least not without a whole lot of them. And think of the hazard. Welcome. And THANK YOU, THANK YOU, THANK YOU for dispelling my growing suspicions that nobody else out there actually understands energy. Like I said… if electricity is the only energy going into the system, and heat is the only energy coming out (and no energy is being stored inside), then the heat energy coming out must equal the electrical energy going in. Raising a heavy object is a perfect example of storing energy inside the system which will be released again when the object is lowered. You could also store energy in a battery, or a spring, or a flywheel, etc. A related thought experiment that fascinated me so much in high school physics that I still remember it: The water temperature at the bottom of a waterfall must necessarily be higher than at the top, due to conversion of potential energy to heat. Given the heat capacity of water, and the water temperature at the top and bottom, you can calculate what the height of the waterfall must be. Amazing. In the vacum of space it’s cold, really cold and that’s becos there is so little energy outthere. If you stand beside the sun, well okay – there is alot of energy, but you get my point. A temperature is trying to outline – dont know if it’s the right word, I’m danish. but the hot/cold will try to become equal temperature. Warm will goto cold. In Denmark we have some of the worlds highest effenicy coal powerplants, the powerplants is often coalpowerplants, but! We use the termal energy that aint used in the turbines to heat up all the houses in the citys. Over 60% of the population is hooked on thise plants, so they get all their energy from thise plants. Here in Denmark we try to do alot for the enviroment, that sayd we have 20% of our electricity coming from windmills – but that’s another disgussion. Those 2 ideas above + a huge tax on energy comes down to that electricity here in DK cost 35 cent/KWh. That gives a incentive to save on energy. BUT. you use electricity to heat you’r house, so I would say that the calculation you use is a bit off, since the energy the freezer wouldent take, you use in you’r radiator. The only thing you save is if you would use your stove more inorder to create the same energy needed to heat the house + that you can unplug the second radiator. I recognize energy is not stored in the freezer. That’s my whole point. Any electrical energy you put in is effectively released as heat, so a freezer is no different from an electric heater as far as the house is concerned. Yes, the freezer will consume less electricity if I put it outside where it’s colder, but ALL of the electricity it consume will then be wasted rather than heating my home. I agree, if I was heating my home by some means cheaper than electric resistance heaters it might make sense to put the freezer outside, but the rocket stove offers supplemental heat at best, so by moving the freezer outside, I would just consume more electricity for heating my home. I am considering installing a ground source heat pump (big capital investment). Then it *may* make sense (having the freezer outside may consume less electricity overall since the increase in electrical consumption of the heat pump will be less than the decrease in electrical consumption of the freezer). Depending on your local, of course, put one freezer out side and one inside. Leave the one outside unplugged (or use your old 10cft freezer outside.) When you need to store more food during the winter let the cold outside keep it cold and let the freezer inside transfer heat to the house. Then you only use one freezer all year. Be sure you keep the outside freezer near an electric plug just in case. Hi….. neat site. You may be interested in how I run a freezer as a fridge, thereby reducing our refrigeration energy consumption by a whopping 80%!